You know what everyone looks for when it comes to picking a new tank? Versatility. Don’t act like it’s not true. Any tactic that you employ, regardless of how appropriate the tank is for it, will eventually leave you bored. That’s why, whichever class you favour, you’d rather opt for a solid game influencer that excels in multiple scenarios. If that’s the way your mind works, then you want to take a closer look at the T26E5 Patriot. 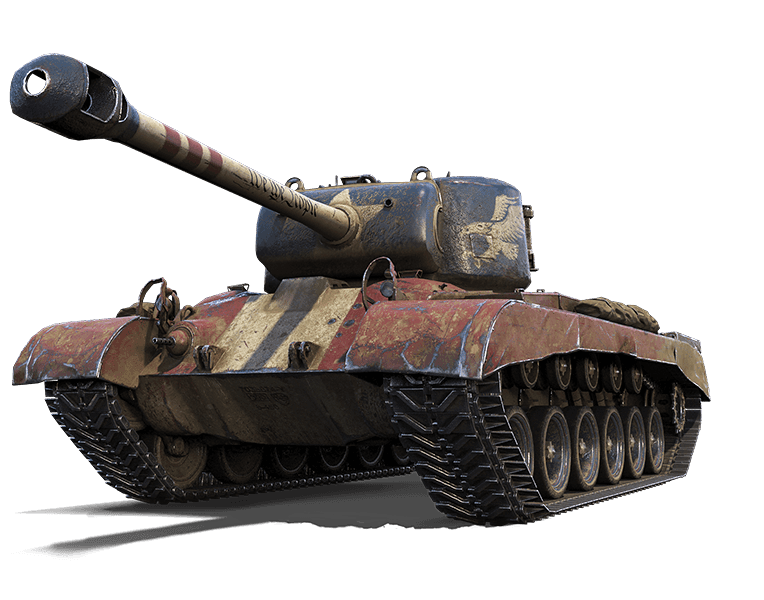 Sturdy, powerful and already revving its engine at Tier VIII, this new American heavy can make a strong contribution on any map. With proper play, it’ll wear down targets in long-range duels, live through face hugging, and destroy the enemy defense line where they least expect it. Excited? Then, read on for a full inspection. Tough turret and strong frontal armor. The T26E5 can take a beating from any Tier VIII medium tank. Angle its hull wisely and you’ll stand just as well against enemy heavies and tank destroyers. Unmatched pain tolerance. With its insane amount of HP (1500), it would take the enemy forever and a day to send you to the scrap heap. Great gun depression/elevation angle. Use hills to hide your hull from enemy fire and you’ll stand strong until the very end of the battle thanks to its combination of solid armor, endurance, and great gun depression. Fast-firing, accurate 90mm gun. Amplify its effect with extra modules and equipment, enroll a fully trained crew, and you will be a huge pain in the side for anyone who has to withstand your damage per minute of over 2,500 DPM. If the odds are in your favour, and you use your skills wisely, it’s enough to crush an enemy IS-7 in less than a minute. And you’ll still have time for two security shots! Base APCR shells. Good shell velocity coupled with 230mm penetration makes the T26E5 an intimidating opponent that can whittle down any foe with confidence. Top speed: 40 km/h. With decent mobility for a heavy tank, it accelerates reasonably well and enables you to secure key positions on the map in the first minutes of the battle, support medium tanks and flex across the map as needed. View range: 390m. Whether you are playing in attack or in defense, the T26E5’s decent view range (one of the best among Tier VIII heavies) allows you to locate enemies before they pose a threat, leaving you with enough time to think over a winning tactic. It’s dangerous to go alone. Playing in attack, team up with medium tanks. Having the T26E5 with its solid mobility, tough, armor and big HP pool on the assault crew will considerably raise your team’s chances at victory. Keep to hillsides. This newcomer has extremely good depression, which, together with a well-armored gun mantlet (280mm), gives the T26E5 a very strong edge in hill fighting, allowing you to hide its hull and fire at enemies from over a ridge. This tactic will come in especially handy when going against Tier X. Maximize firepower and fire control. The T26E5 is at its best when it secures a favorable position to abuse its DPM to the fullest. See-sawing from around the corner will do more harm than good: the majority of heavies have bigger alpha than you and trading shots with them won’t get you far. Steer away from sidescraping. Although it’s a safe tactic for most heavies, angling to expose your side won’t work for a T26E5 that has pretty non-existent armor. Use your mobility to mitigate this weakness and keep away from positioning yourself face-to-face on urban maps. Get the big picture. The universal soldier that it is, the Т26Е5 can perform equally well in long-range duels, rough offensives, and flanking unsuspecting opponents. Keep an eye on the minimap to track where it can be of use to the team and adjust your tactics accordingly. At the top of the list, you can beast in a variety of different positions and circumstances. Choose whatever tactics you like, but don’t forget about the team. Coordinate a battle plan with them and use your strengths to lead your comrades to victory. If you are fighting against tiers IX–X, don’t rush into the vanguard. Play as a direct support vehicle, picking out enemies unseen from the second line of fire or snipe them from afar. Let top tier tanks pound on each other, waiting until one of them exposes a weak spot. Then, rain destruction on a vulnerable opponent with a few accurate shots. If you have a soft spot for heavies, enjoy a good old-fashioned brawl, and want to boost your earnings per battle, the Т26Е5 is a great tank to have in the Garage.